Using a variety of instructional tools in all grade levels can have several advantages, and the use of social media in the classroom can offer particularly relevant tools for students from elementary to post-secondary classes. Networking, communication skills, and classroom support are all benefits of incorporating various social media tools into curriculum. Increasingly, students are looking for the ability to access answers and feedback outside of the classroom. 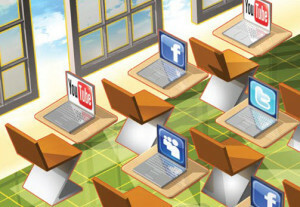 As the use of social media and other internet tools changes the immediacy of this contact and connection, teachers are able to utilize social media tools to support students outside of the classroom, and students are also able to gain support from one another. One social media tool that can help with this is the incorporation of a private Facebook page for a class to utilize outside of school. Teachers are able to post assignments, answer questions, and provide additional explanation for any questions students might have, utilizing after school hours and weekends to continue to learn. Additionally, students have the ability to get answers and ideas from one other, improving and increasing the feedback and brainstorming that can be so essential in gaining critical and creative thinking skills. Another tool that teachers can utilize is the use of a private YouTube channel to share instruction through video. Taping lectures and posting later to YouTube allows students to reference the material and explanations at other times during the week, which can be particularly helpful when working on a math problem or editing an English paper outside of normal classroom hours. Another useful social media tool is the use of Twitter in order to provide status updates, reminders, and reinforcement of key points to supplement learning material. Some examples of when this can be beneficial include providing students with important reminders for upcoming tests and assignment due dates. Teachers can share information right away for a weekend program on television or other supplemental material that otherwise might be missed. More information on using social media and its benefits can be found at the National Education Association website. For older students, using networking tools such as LinkedIn can also help to begin to build connections for job positions and post-secondary endeavors. Students can learn valuable tools for professional communication skills, building a resume and portfolio, and using research skills to find relevant materials and information for future careers and degree pursuits. Facebook also provides lessons in networking and learning about professional communication and impressions on employers and others. Another benefit of using social media in classes is the ability for parents to stay involved and informed through every step of a student’s education. Parents can get real time updates during field trips, check homework, review grades, and even get involved in support through sharing their own experiences and knowledge with a classroom of students. As social media continues to be an increasingly prevalent part of society, particularly for younger generations, the use of these tools in classrooms is advantageous for preparing for the future of communication. Social media in the classroom is beneficial for students and parents in various areas of educational support, positive communication, and relevant career skill building.